This might be a bug? I tried using door:on_opened(), but it seems to not be working. I double checked the name and everything. This function is called during an opening of a door, right? The same occurred with door:is_open(). The door is indeed open, but nothing happens. That worked fine, so maybe it's an issue with Solarus 1.5.3? I'm running 1.5.1. That or you actually do have a typo in your door entity's name on the map. Just to cover all the bases, it is a door entity, right? Sometimes I use NPCs as doors and just set them disabled whenever I need the door open, but that would never call door:on_opened(). I am pretty sure. Here is an image to prove it. I made sure all the animations existed as stated in the documentation. 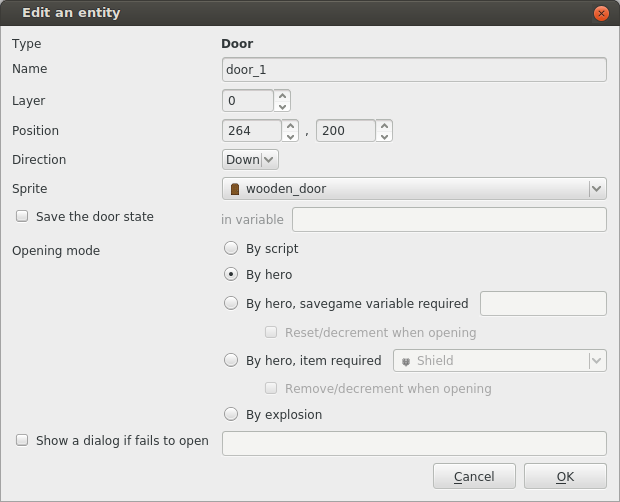 Also, I mentioned the function door:is_opening() working. Does the animation "opening" of your door sprite correctly ends? Because if it loops, that might explain that the opening state never finishes. It works now. Thank you Christopho! Indeed, a delay of 0 means to loop forever.